B Corporations: What do they mean for nonprofits? 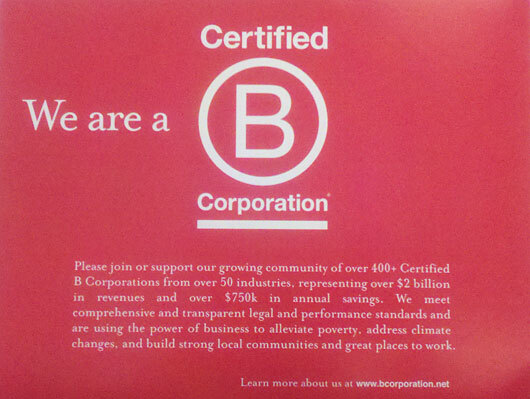 B Corps use the power of business to solve social and environmental problems. Target audience: Social enterprises, nonprofits, NGOs, foundations, businesses, educators. Anew type of corporation has come along that makes money and does good for society and the environment. They’re called B Corporations, for benefit corporations. Nonprofits can smile about these dual-focused companies because they make great like-minded partners, and they may help fund and support their social good goals. B Corporations first appeared four years ago. Today, more than 400 companies across 50 industries and several countries have achieved certification by B Lab, the nonprofit that recognizes for-profit companies as being ethical, socially aware and eco-conscious. Basically, B Corps have to do more than report to their shareholders; they have to consider the people around them and the world they work in. Being able to stand out in the social enterprise sector is a benefit for them. I first learned about B Corps at a meeting in Atlanta and thought they sounded like a great idea for the increasing numbers of consumers seeking good companies. Of course, people at nonprofits are often seeking out companies behaving ethically as well. Companies know that people want to be green. B Corps cut past the marketing hype and greenwashing as companies that are truly committed to policies that promote the social good. Some nonprofit leaders have come out against B Corps. They say that nonprofits might now get as much money because people will choose to back B Corps rather than nonprofits. Many companies that serve mainly nonprofit customers are deciding to become B Corps, including PhilanTech, Care2 and PICnet. Nonprofits that want more information about the relationship between nonprofits and B Corps should visit bcorpsfornonprofits.com. As a nonprofit, what do you think about B Corporations?